RIO DE JANEIRO, BRAZIL – On Wednesday, October 5th, according to a Reuters Brasil source, one worker has been killed and another has lost his leg in separate accidents during disassembly of Rio 2016 Olympic venues. 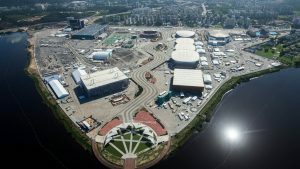 The anonymous source indicated that workers’ safety at these sites has been severely compromised due to the Rio 2016 Committee’s delays in paying service providers and its recent dismissal of safety inspectors. Olympic Park in Barra da Tijuca, according to Rio 2016 a fatal accident occurred in the last several days during disassembly, photo courtesy of Rio 2016. “The Olympics was a success, but for the future, I fear it may end in tragedy. I fear that more accidents will occur,” the source told Reuters. According to the anonymous source, both accidents can be traced to Rio 2016’s recent dismissal of more than one hundred safety inspectors who would have been responsible for monitoring the dismantling of these facilities. Further, the source argued that the delay of Rio 2016 to pay some suppliers and service providers at the Olympics and Paralympics has caused some companies to employ less-than-qualified individuals and use cheaper equipment, thereby increasing the risk of accidents. The Rio 2016 Organizing Committee confirmed to Reuters Brasil that in the past few days both accidents did occur, with one worker being electrocuted at Barra da Tijuca, and another having his leg amputated after an incident during disassembly of the beach volleyball arena in Copacabana. However, Rio 2016 said the responsibility for these accidents lies with the companies hired to deliver these services.